Klipsch enters smart speaker race with ‘The Three | Google Assistant’ | What Hi-Fi? Klipsch has smartened up its The Three Heritage Wireless speaker by giving a new version of it Google Assistant voice control. 'The Three | Google Assistant' (its official title, awkwardly) combines music playback via Bluetooth and wi-fi, with Google’s voice assistant giving users the ability to, for example, ask questions and get information, stream music, hear the news, weather and traffic and control smart home devices - all by simply using their voice. Klipsch’s first smart speaker borrows aesthetics, features and, allegedly, sound performance from the standard (‘dumb’) edition of the speaker. 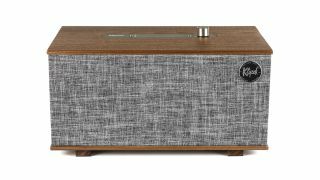 It features a stereo driver configuration (two 5.75cm full range drivers) and 13cm integrated subwoofer, and sports a familiarly retro-luxury look thanks to its real wood veneer and aluminium controls. That and its £450 price tag certainly set Klipsch’s offering apart from the more compact and affordable Amazon Echos and Sonos Ones of the smart speaker world, so if you're looking for an obedient speaker that has a bit more muscle than the most popular players, this could be worth consideration. The Three | Google Assistant will be available in the UK imminently.